Super cute!! 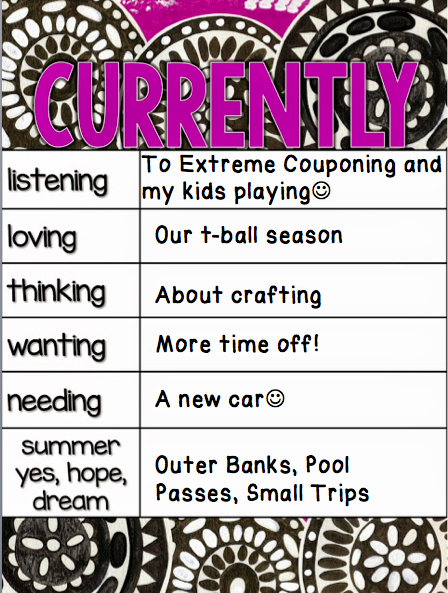 LOVE that you're thinking about crafting...that's always a sure sign that summer is on it's way! I can't wait to see what projects everyone starts coming up with when we have some free time again!! I love that Farley's link up requires us to post on other blogs-I love meeting new people! I see that your name is Stephanie, too! :-) Nice to meet you-I love your blog! Aww, I kind of can't wait to put my son in t-ball! We're just doing swimming lessons this summer, but I'm thinking about adding soccer soon. They're so cute at that age when they're just learning! Good luck with car shopping, and have a great weekend! So fun! Car shopping is not fun in my opinion! I have a Ford Escape right now too! We have looked at Traverse which I think is very similar to the Acadia. I miss T-Ball! My boys play soccer! We have had a lot of games postponed due to rain too. Your trips sound like so much fun!! Have a great month!